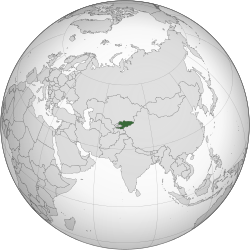 Kyrgyzstan (Inglis pronunciation: /ˈkɜːrɡɪstɑːn/ KUR-gi-stahn; Kyrgyz: Кыргызстан [qɯrʁɯzstɑ́n]; Roushie: Кыргызстан [kɨrɡɨsˈtan]), offeecially the Kyrgyz Republic is ane o the sax independent Turkic states thegither wi Turkey, Azerbaijan, Turkmenistan, Uzbekistan an Kazakhstan. Locatit in Central Asie, landlockt an mountainous, Kyrgyzstan is bordered bi Kazakhstan tae the north, Uzbekistan tae the wast, Tajikistan tae the soothwast an Fowkrepublic o Cheenae tae the east. Its caipital an lairgest ceety is Bishkek. "Kyrgyz", is believed tae hae been derived frae the Turkic wird for "fowertie", in reference tae the fowertie clans o Manas, a legendary hero who unitit fowertie regional clans against the Uyghers. At the time, in the early 9t century AD, the Uyghers dominatit muckle o Central Asie (includin Kyrgyzstan), Mongolie, an pairts o Roushie an Cheenae. Bi extension, Kyrgyz is an aa thocht tae mean "unconquerable" or "undefeatable". The 40-ray sun on the banner o Kyrgyzstan is a reference tae those same fowertie tribes an the graphical element in the sun's centre depicts the widden croun o a yurt—a portable dwellin tradeetionally uised bi nomads in the steppes o Central Asie. Kyrgyzstan is ane o the twa umwhile Soviet republics in Central Asie tae retain Roushie as an offeecial leid (Kazakhstan is the ither). It addit the Kyrgyz leid tae acome an offeecially bilingual kintra in September 1991. This bilingualism wis intendit tae signal tae the ethnic Roushies that thay wur walcome in the new independent state, in an effort tae avoid a brain drain. Kyrgyz is a member o the Turkic group o leids an wis written in the Arabic alphabet till the twintiet century. Latin script wis introduced an adoptit in 1928, an wis subsequently replaced bi Cyrillic script in 1941. Generally, fowk unnerstaund an speak Roushie aw ower the kintra, except for some remote muntain auries. Roushie is the mither tongue o the majority o Bishkek dwellers, an maist business an poleetical affairs are carried oot in this leid. Till recently, Kyrgyz remained a leid spoken at hame an wis rarely uised durin meetins or ither events. Housomeivver, maist parliamentary meetins the day are conductit in Kyrgyz, wi simultaneous interpretation available for those no speakin Kyrgyz. 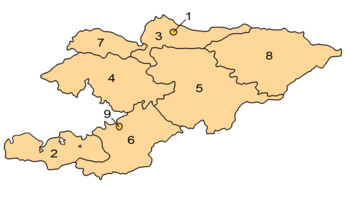 Kyrgyzstan is dividit intae seiven provinces (sing. oblast (область), pl. oblasttar (областтар)) admeenistered bi appointit govrenors. The caipital, Bishkek, an the seicont lairgest ceety Osh are admeenistratively independent ceeties (shaar) wi a status equal tae a province. Each province comprises a nummer o destricts (raions), admeenistered bi govrenment-appointit offeecials (akim). Rural communities (ayıl ökmötü), consistin o up tae 20 sma settlements, hae thair awn electit mayors an cooncils. ↑ "Constitution". Government of Kyrgyzstan. Retrieved 23 September 2009. ↑ 4.0 4.1 4.2 4.3 "Kyrgyzstan". International Monetary Fund. Retrieved 18 April 2012. ↑ "Human Development Report 2009: Kyrgyzstan". The United Nations. Retrieved 18 October 2009. Wikimedia Commons haes media relatit tae Kyrgyzstan. This page wis last eeditit on 4 Mairch 2018, at 03:55.